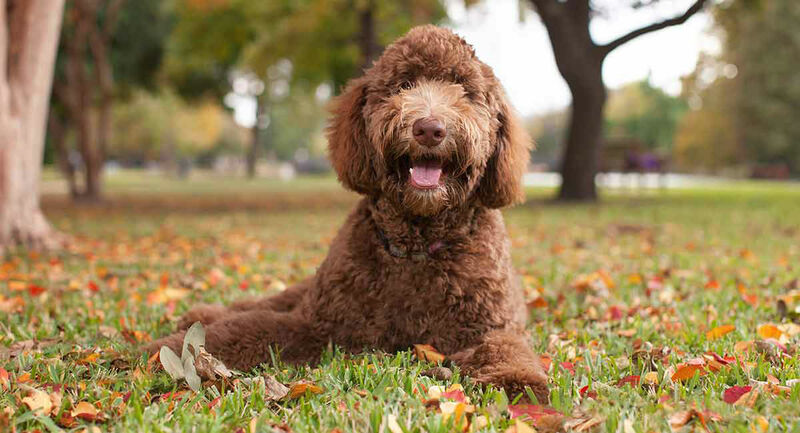 Chances are you’ve already heard of the Labradoodle. This Labrador Poodle mix is one of the most popular crossbreed dogs in the world. These adorable, curly haired dogs are so prized they often cost more than their purebred parents. In this guide, we will look at what makes this breed so popular. Could the Labradoodle be the right dog for you? When you cross two purebred dogs, the puppies are called designer dogs. Labradoodles were one of the very first designer dogs, created in the late ‘80s. They were bred in an attempt to create hypoallergenic service dogs. A blind woman living in Hawaii wrote to the Royal Guide Dog Association of Australia in 1988. She needed a service dog but said that her husband was allergic. So, she asked if there was a way to have a guide dog that would not shed hair. Wally Conron was assigned the task of finding her a dog. He first tried Standard Poodles.. However, more than thirty dogs over the course of three years all failed to make it as a guide dog. That’s when Conron came up with the idea of crossing his best female Labrador Retriever with a Standard Poodle. One of the Labrador Poodle mix puppies ended up being a great guide dog. Conron decided to call these crossbred dogs Labradoodles as a PR gimmick. There is a lot of controversy around designer dog breeding. And many debates about whether mixed breeds are better or worse than purebreds. The Labradoodle has been at the front line. There are “Doodle haters” online claiming that the hype over Doodles is promoting the unethical breeding. Conron is reported to have regretted his creation saying “I released a Frankenstein”. Sudden popularity in any breed or mix breed can result in lots of bad breeders jumping on board. In the hope of earning a few dollars. Some, like Conron began to worry about “backyard breeders”. People who don’t follow standards or properly check and test the parent dogs. Are mix breed dogs healthier? One of the basic arguments about designer dogs is whether mixed breed dogs are healthier. This is very difficult to prove. But in general terms the answer is yes. Long life is a good indicator of health in a breed. Purebred dogs breed true. That means we can predict their looks and character, from one generation to the next. Mix breed dogs do not breed true. Appearance and character can vary from one puppy to another. On the other hand research has shown that purebred dogs lack vigor compared with mixed breeds. Lack of genetic variety causes small litter sizes, and lower survival rates too. Labradoodles are not registered with a Kennel Club such as the AKC. There are however, a number of breeders and breeding clubs. Which parent does a Labradoodle take after most? Or they could share a mix between the two. In addition, a Labradoodle is not always a cross between a Labrador and a Standard Poodle. That’s the largest size Poodle. Labs mixed with smaller poodles are still often called Labradoodles. You may hear of smaller dogs called Mini-Labradoodles. Another term you may come across is Australian Labradoodles. This doesn’t mean that the dogs are descended from Conron’s first doodles. Some Australian Labradoodles have Cocker Spaniel added into the mix as well. This can make it tough to tell the background of a Labradoodle. At least not without looking into the parentage of the individual dog. What goes into a Labradoodle? However, it’s important to keep the possible variety in mind when you’re choosing a puppy. A good breeder will have kept careful records of their dogs’ ancestry. You’ll also hear the terms F1 and F2 when it comes to the Doodle breeds. There are several different types of Labradoodles. An F1 Labradoodle is a first-cross between a pure Labrador Retriever and a pure Poodle. How curly the coat is may vary. But it is usually looser than a poodle coat. Other than size, the characteristics are typically the same between crosses, whether the poodle parent was a miniature, medium or standard. F2 labradoodles, on the other hand, are second-generation dogs. This means both parents were an F1 labradoodle. F2 matings do not breed ‘true’ to type. An F1B Labradoodle is a first-generation back cross. This means an F1 was bred with a purebred Poodle to get F1B puppies. Typically, this makes the Poodle characteristics more dominant, such as a curlier coat that sheds less. Weight and height ranges are typically the same. Curly coats are popular. That’s because some people with mild allergies find curly coated dogs easier to live with. Labradoodles are typically square and compact in build. They should be a strong dog that is well-balanced and athletic. The biggest difference between miniature, medium and standard poodles is size and weight. This means labradoodle weight will primarily depend on what type of poodle was one of the parents. Standard labradoodles range between 24 and 26 inches in height. They may reach 55 to 95 pounds in weight. Medium labradoodles can range between 21 and 23 inches in height. They may reach 25 to 45 pounds in weight. Miniature labradoodle size is between 14 and 16 inches. They may reach 15 to 25 pounds. It is less common for a Labrador to be mixed with a Miniature Poodle. A Labradoodle life expectancy can vary widely. Labrador Retrievers typically live 10-12 years. Poodle lifespan can vary anywhere from 10-18 years, depending on the type and size of poodle. This means Labradoodle lifespans could be 10-18 years. Labradoodles can have three different potential coat varieties. They can have coarse hair like a Labrador, particularly in F1 crosses. However, this is typically seen as undesirable. They can have the wool coat of a poodle, or they can have a fleece coat. Labradoodles only have a single coat, not the double coat of a typical Lab. The length can also vary, but is often 3-6 inches long. Unfortunately, no dog is 100 percent hypoallergenic. However, poodles are one of the closest breeds you can get to completely allergy-free. And some people that are allergic to dogs are less sensitive to Poodles. That does not mean that labradoodles always have the same traits. According to Conron, out of the first litter of labradoodles, there were three puppies, only one of which was hypoallergenic. The next litter was 10 puppies, and three of them were hypoallergenic. One of the arguments for F1B labradoodles is that the second crossing with poodles is supposed to increase the likelihood of the resulting mix not causing allergies. However, there is no guarantee that a labradoodle will be hypoallergenic. To confirm whether one is, the hair and saliva need to be tested by a registered laboratory. The ideal coat type is low maintenance and low shedding. Labradoodles are supposed to not have the shedding of Labs. Nor are they meant to require the clipping and grooming of poodles. Matted fur is a big problem for some curly coat dog breeds. Many Labradoodles need grooming and clipping regularly to prevent matting. Your Labradoodles’ needs will depend on the coat type your puppy ends up with. The curlier the coat, the more maintenance will be required. If your puppy has the woolly coat of a poodle, you may need to take it into a professional groomer once a month for a clip. It’s important to make sure you brush your dog right down to the skin and never shave it to avoid causing painful matting. Labradoodles are marketed as friendly, easygoing dogs. Great with small children and perfect for families. And to some extent this is often true. On the other hand both Labradors and Standard Poodles are big, intelligent dogs that have a lot of energy. This means that training and long daily walks are a must. Labradors are known for being easy to train but they are also very friendly, and bouncy. Most love to rush up to other dogs and humans to say hello. This can be hard to manage when they are young. Poodles tend to be a bit more reserved and some Labradoodles will inherit this trait. But with a mix, there is no guarantee that a Labradoodle will be more laidback or calm than a Labrador. There is also no guarantee it will be friendlier and more outgoing than a poodle. Are you laid back about what you get? A Labradoodle could inherit the traits of either parent breed or end up with something in the middle. Unfortunately, there have been many news stories in recent years about how a Labradoodle did not end up having the expected temperament. Many of these dogs ended up in a shelter or the Doodle Rescue Collective. Therefore, it’s important to know that temperament can never be guaranteed. Proper socialization and training are incredibly important whenever you bring home any new puppy. One of the arguments for designer dogs is the larger gene pool. More genetic variety should mean less health problems. On the other hand, good breeder it vital to give a puppy the best start in life. And that good breeder can be hard to find when looking for a mix breed dog. Make sure any puppy has had all necessary checkups. You’ll also want to make sure the parent dogs have both been tested for common health issues in their breed. Ask to see those health certificates! It’s important to check the hip and elbow scores of both parents to reduce the chance of a puppy having dysplasia. Both the puppy and the parents should also have eye tests conducted. Both Labradors and poodles are active, energetic dogs that need regular exercise and mental stimulation. Therefore, it’s safe to expect the same needs from a labradoodle. Both parent breeds are working class dogs, which typically have a lot of stamina. This means a short walk will not be sufficient. Daily long walks, hikes or runs should occur, as well as play sessions with you or other family members. With two clever parents your Labradoodle should be a smart dog. And easy to train. They will do well with lots of mental challenge, such as obedience or agility courses. They may also do well with hunting and fetching. Poodles and retrievers were both originally water dogs. So it’s likely your adult Labradoodle will love the water and swimming, although this is not a guarantee. Labradoodles are eager to please and will respond well to regular training. Positive methods will give you great results and a happy dog! The Labradoodle is often a great family dog. Social, easy to train, and good with older children. Your Labradoodle will probably also be good with other dogs. If your kids are very small you might want to wait a while, or go for a mini-Labradoodle. Large Labradoodles are very bouncy when young. This is not a breed for homes that are empty all day. Or for those that mind a bit of mess. These are social dogs that like company. They are also happiest out walking, and love to get muddy. The curlier coated doodles all need quite a bit of grooming. If you require a hypoallergenic dog, think carefully. You could have the hair and saliva of a puppy tested to confirm you will not be allergic to it. Also remember that Labradoodle shedding is still possible, even with a hypoallergenic coat. There are some some poor dog breeders around today. And sadly, designer breeds seem to attract them so be careful. Avoid puppy mills, pet stores and markets. Never buy a puppy without meeting the Mom. Try to see the Dad too. Look for a litter of puppies that is being raised indoors with a family. Check health certificates and walk away if the breeder says mixed breed dogs don’t need them. If you choose to adopt a Labradoodle, make sure it’s from a recognized shelter that has completed a temperament assessment. It is also wise to get it checked out by a veterinarian before adopting, if the shelter has not already done so. Labradoodle costs can also vary across breeders. A labradoodle pup could range from $1,000 to $3,000. If you can’t afford the labradoodle price, another option is to adopt from a shelter or rescue. 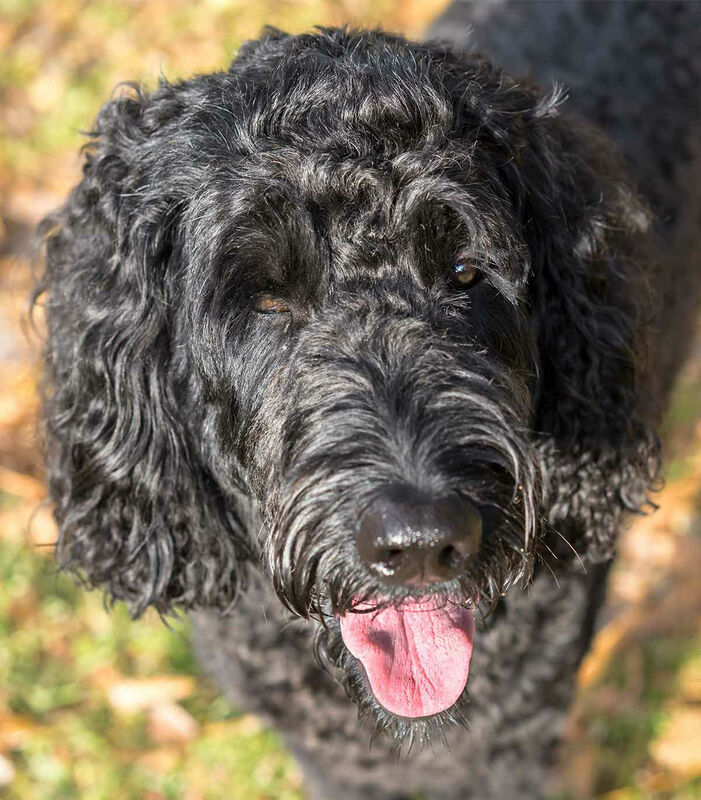 The ideal home for a Labradoodle will be one with an active family who wants a loving, energetic furball of a playmate. You also need to be willing to put in the time and effort to properly train, socialize and take care of it. Check out our puppy care section for training guides, puppy care information and much more. Don’t forget to join the forum for help with your pup. And tell us all about them in the comments box below! Barnett, K.C. 1988. “Inherited Eye Disease in the Dog and Cat”. Journal of Small Animal Practice. Beuchat, C., 2014. “The Myth of Hybrid Vigor in Dogs…Is a Myth”. The Institute of Canine Biology. Harasen, G., 2006. “Patellar Luxation”. The Canadian Veterinary Journal. Lim, C., et al., 2011. “Cataracts in 44 dogs (77 eyes): A Comparison of Outcomes for No Treatment, Topical Medical Management, or Phacoemulsification with Intraocular Lens Implantation”. The Canadian Veterinary Journal. Oliver, J. and Gould, D., 2012. “Survey of Opthalmic Abnormalities In The Labradoodle”. The Veterinary Record. Patronek, G.J., et al., 1996. “Risk Factors for Relinquishment of Dogs to an Animal Shelter”. Journal of the American Veterinary. Medical Association. Pedersen, NC., et al., 2012, “Genetic Characterization of Healthy and Sebaceous Adenitis Affected Standard Poodles from the United States and the United Kingdom,” Wiley Online Library. Trbolová, A. and Ledecký, V., 2000. “The Relationship Between the Occurrence of Lens Cataract and Progressive Retinal Atrophy and Some Categories of Poodle Breeds”. Folia Veterinaria. Vredegoor, D.W., et al., 2012, “Can F1 Levels of Hair in Different Dog Breeds – Lack of Evidence to Describe Any Dog as Hypoallergenic”. Journal of Allergy and Clinical Immunology. It sure is nice that you mentioned how important proper socialization and training are whenever you bring home any new puppy regardless of the breed. My wife is thinking of gifting our niece a labradoodle for her birthday since she’s been asking for a puppy to accompany their old dog. I’ll definitely send this article to my wife so she can consider what type of training programs will be best for my niece’s new dog.